The New York Yankees are in a period of transition. For the first time in 12 years they will be led by a new manager and this off-season we saw them use a little bit of fiscal restraint, opting to go with young and unproven talent over the big name veteran. One thing that has not changed are expectations. This year as always the Yankees and their fans expect a championship. New manager Joe Girardi even dons number 27 on his back as a constant reminder of what they are working towards. Before the team starts thinking about October or even April there are some key issues they must address. The most pressing issue at hand is how to use 22-year-old Joba Chamberlain. Chamberlain made 19 appearances out of the Yankees' bullpen at the end of last season after being groomed as a starter his entire professional career. At the time the plan was that come 2008 he would go back into the rotation, but two issues at hand have prevented this. 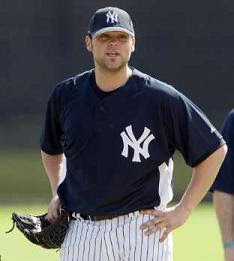 The first is the Yankees would like to limit him to about 140 innings this season after throwing about 112 last year. Also he was such an effective bridge from the starting pitchers to Mariano Rivera that it is tempting to keep him in that role. To handle this it seems like the Yankees plan for him is to start the season out of the bullpen until June or July. At that point it is likely that they will send him to the minors for a brief stint to get into shape to become a starter. Then they would call him back up by August to finish the stretch run in the rotation. Of course this plan is tentative and will likely change if injuries occur. Then there is the matter which players will be joining Chamberlain in the Yankees bullpen to start the season. Aside from Rivera only Kyle Farnsworth and LaTroy Hawkins have guaranteed contracts this season which means there will be about three spots left to fill. Jonathan Albaladejo, a 25-year-old who came over from Washington via trade, will have a shot at opening the season with the team. Albaladejo pitched in 14 games for the Nationals last season and was very effective with a 1.88 ERA. Brian Bruney will also have a shot at making the team. After a disappointing 2007 Bruney has reportedly dropped 20 pounds and added a slider to his repertoire which could make him more effective. Other likely candidates to open the season in the Yankees pen are Chris Britton, Edwar Ramirez, Ross Ohlendorf, and Jose Veras. With no other lefty specialist, Sean Henn even has a chance and Kei Igawa also has an outside shot after being a complete bust last season. Aside from pitching the only position spot which needs to be filled is going to be at first base. As of right now this position is Jason Giambi's to lose, which he almost certainly will, to injuries. After injuring himself walking around the bases Giambi only appeared in 18 games at first last year. With more of the same expected, look for Shelle y Duncan and Wilson Betemit to challenge each other for playing time. The Yankees also signed Morgan Ensberg as an insurance policy at first. Although with a grand total of one game ever played at the position it is unclear right now that he will fit on this team. His offensive numbers have also dropped quite a bit over the last three years. The last pressing issue is how will Girardi juggle the playing time between Giambi, Hideki Matsui, and Johnny Damon. With Melky Cabrera currently entrenched in center field, Damon will see the majority of his playing time in left field where Matsui used to play. Matsui will likely be the everyday DH, but even if Giambi stays healthy he's going to need a decent amount of time as the DH. To deal with this issue Damon may see some playing time at first base, but ultimately Matsui and Giambi are going to be bench more than either are used to.